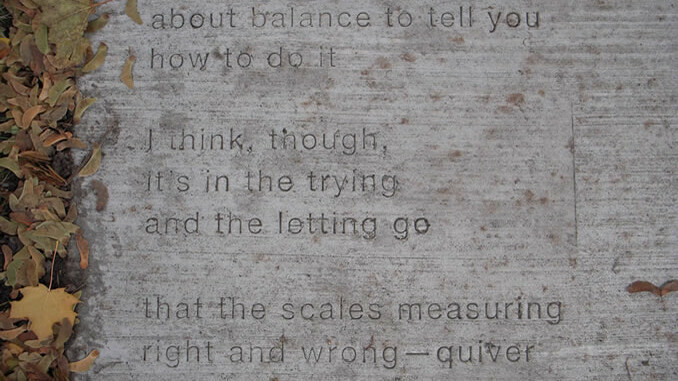 There's long been a certain poetic quality to Williamson Street and now there's poetry embedded in its sidewalks. In front of Broom Street Theater, 1119 Williamson St., is a poem by its longtime artistic director, Joel Gersmann, who died in 2005 at age 62. ... Gersmann's poem is one of four poems that were stamped Friday and celebrated Sunday with a walk to each location spread across seven blocks of Willy Street. ... "It's kind of a pilot for more poems in this neighborhood or potentially in other neighborhoods," said Karin Wolf, Madison's arts program administrator, who spearheaded the project. Businesses Weary Traveler and Plan B put up most of the money for the poetry stamps, which cost about $700 each, an amount Wolf called affordable. The “Willy” Street project was inspired by a similar (and larger) one started a few years back in St. Paul, Minn. called Everyday Poems for City Sidewalk. I suppose projects like this are easier to make happen in cities that care enough about poetry to have a poet laureate. Oh snap. Note: The photo above, courtesy of publicartstpaul.org, is from the St. Paul project.